I’ve been working on a lovely story by author David Merron, whose experiences as a wartime evacuee from London are to be published as ‘Goodbye, East End’. David came from a close-knit Jewish community in the Aldgate area of the city and when he was evacuated to the countryside his world changed forever. This is a fascinating story, not least because of the unique perspective David brings to both city and countryside that have changed forever. Now in his 80s, David has written for pleasure all his life and has finally been published by Transworld – which just proves that if you persevere you will get there in the end! David’s story was a cracker from the story and to be honest, it required very little input from me in terms of ghostwriting. It was all there; it just needed a little support and some hand-holding, which all writers require from time to time. David is a natural storyteller with an incredible eye for detail and a memory to match, though I guess it’s hard to forget the events of World War Two if you were caught up in them, in whatever way. The book will be published in July and is a cracking read! Below is the publisher’s blurb…. 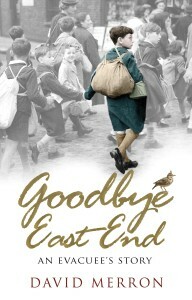 At the start of World War 2, when Hitler’s bombs threatened to rain down hell, eight-year-old David Merron was taken from the heart of his close-knit Jewish community in London’s East End and evacuated to the safety of the English countryside. Transplanted into an alien world, adrift from his nurturing family and at the mercy of strangers, life was frightening and lonely. The strangeness of this new existence – its religious and cultural shifts – left David confused and questioning not only his faith but his very sense of self. But, with time, David realised that the rural world was also beautiful. Far from the cramped and often poverty-stricken East End, the countryside was wild and wonderful – an adventure playground in which a curious lad was free to flourish. Immersed in the ebb and flow of country life, David harboured a secret. Increasingly, he didn’t want to return to the dirty streets of the East End. Sometimes, he didn’t want the war to end. David’s moving memoir is about a small boy’s burgeoning love of the countryside and the confusion he felt about missing – and yet not missing – home. Set against a wartime backdrop of flaming skies and pluming black smoke, it is a celebration of the wonder and tranquility of the natural world that changed the shape of David’s life.